Blackmores Conceive Well™ Gold has been formulated with a combination of nutritional oils and vitamins specially chosen to prepare the body for conception. It not only helps supplies nutrients for healthy ovulation, it also supports a healthy female reproductive system and provides powerful antioxidants involved in normal conception. 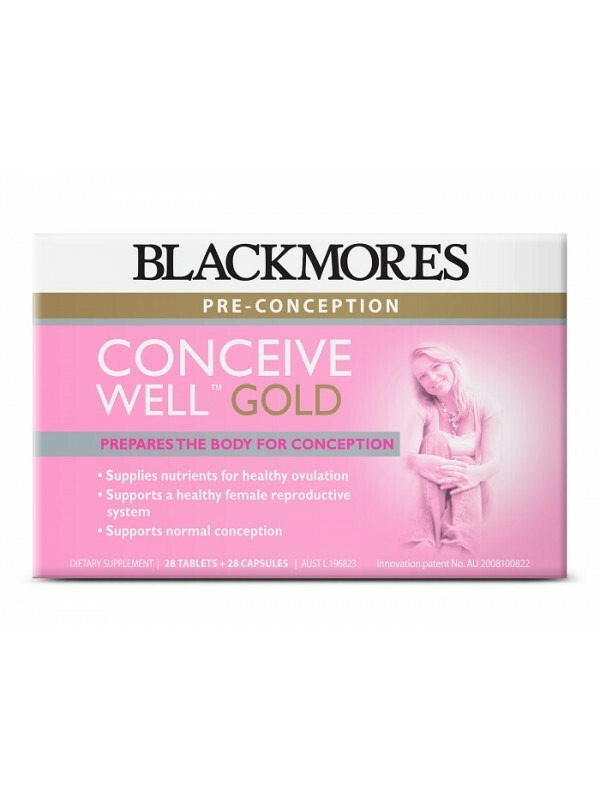 Blackmores Conceive Well™ Gold is formulated for pre-conception care, supplying the nutrients needed in preparation for conception and pregnancy. Antioxidants – are important for women attempting conception. Chances of conception increase in women with higher levels of antioxidants in the fluid surrounding their reproductive organs. CoQ10 – Levels of CoQ10 decrease with age. Adequate levels of CoQ10 in the expectant mother are associated with healthy early stages of pregnancy. Iodine - is important for the normal functioning of the thyroid gland as it is an essential nutrient required for the synthesis of thyroid hormones. Thyroid hormones affect almost every cell in the body and regulate oxygen use, metabolic rate and cellular metabolism. Iodine plays an important role in normal brain development and eyesight. Tuna oil - is a source of omega-3 long chain fatty acids. DHA is particularly important for the normal function of the brain, and for development of normal eyesight. Folic acid - plays a role in DNA and RNA synthesis, and is therefore critical in cellular division. In order to divide properly, cells need adequate folate. The development and growth of a foetus involves constant cell division, which can lead to an increase in the mother's demand for folate. Vitamin C – is needed for hormone production and may help to stimulate normal ovulation. The developing egg needs adequate vitamin C to mature. The ovary contains one of the largest ascorbic acid stores in the body. Iron - a component of haemoglobin, an essential component of red blood cells. Haemoglobin transports oxygen in the body. Having optimal haemoglobin levels helps the cells of the body receive sufficient oxygen. Early foetal brain development requires adequate iron. Zinc - essential to good health as it is involved in many enzyme reactions in every cell of the body. Adequate levels of zinc support normal conception and are essential for a healthy baby's normal growth and development. B group vitamins - play an essential role in the production of energy and support normal conception. For more information on planning conception visitwww.preconception.com.au, a one-stop shop providing you with key information when trying to fall pregnant. No added yeast, gluten, wheat, milk derivatives or preservatives. No artificial flavours or sweeteners.